You've arrived at www.backstromwellness.com, the online home of chiropractor Dr. Donald Backstrom of Backstrom Chiropractic. Located in Glen Ellyn, Illinois, Dr. Backstrom is dedicated to helping you achieve your health goals, combining skill and expertise with over 30 years of experience. 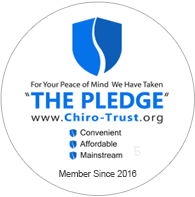 Dr. Donald Backstrom has taken the Chiro-Trust Pledge, which states: "To the best of my ability, I agree to provide my patients convenient, affordable and mainstream chiropractic care. I will not use unnecessary long-term treatment plans and/or therapies." Patients seeking treatment with Dr. Donald Backstrom are assured of receiving only the finest quality care through the use of modern chiropractic equipment and technology. Dr. Donald Backstrom and the staff have a genuine concern for your health! Come visit Backstrom Chiropractic in Glen Ellyn, Illinois. At Backstrom Chiropractic, Dr. Donald Backstrom and the chiropractic team seek to uncover your health and wellness picture, find the origins of health problems, and fix those at the cause. We look forward to your visit at our office in Glen Ellyn, Illinois.